The Corporate Clothier has been providing innovative promotional solutions to our clients since 1992. Whether you want to improve your corporate image, promote your business, thank your existing clients or employees, or require give-a-ways for tradeshows, we have the right products, at the right price. Our offshore manufacturing facilities provide us with the competitive pricing and excellent quality. The elimination of the middleman results in cost savings, which are passed on to our clients. In addition, this relationship enables us to provide Private Label programs. Our domestic partners work hand-in-hand with us to provide you with all your corporate clothing requirements. Our services don't end with just clothing. If you need promotional gift ideas, we can deliver. Whether you are looking for pens, coffee mugs, tradeshow gifts, golf tournament prizes and awards, we have it. You may need fine leather goods, or that special crystal award to recognize top performers. Simply click on the Products button to see a listing of our products and preferred suppliers. If you don't see what you are looking for, call us. 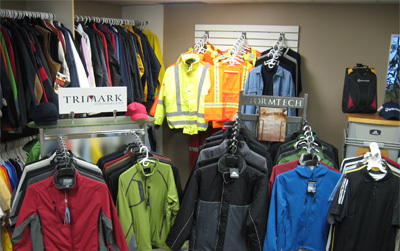 We carry an extensive line of sample products right in our showroom. We know we have the right solution for the right price, delivered on time. Call us and find out why we are the best-kept secret in the promotional industry.